When you set up a company-wide email signature on Exchange or Office 365 using, e.g. the built-in transport rules feature, you will probably want to verify whether it is correctly added to messages. The most straightforward and foolproof method is for users to send a test email to you so you can check it. Or, if you feel like taking a crowdsourcing approach, just have each user send the email to themselves and check the details, etc. personally. The problem with both those methods is that they rely upon users correctly understanding your request, complying with it and carrying it out properly, all without assistance. Realistically, you have a higher chance of randomly meeting Bill Gates walking down your street with a pet iguana on a leash, than for all 3 of these circumstances to come together magically. As in many cases, here also PowerShell scripts can save you a lot of time and effort. The two scripts below utilize the Send-MailMessage cmdlet to send a test message from multiple Exchange/Office 365 users to either their own or your address. Since company-wide email signatures are added on the level of the server, no additional actions need to be taken for the messages to be stamped with proper footers. I included the –BodyAsHTML switch in both scripts because HTML emails are most common nowadays. 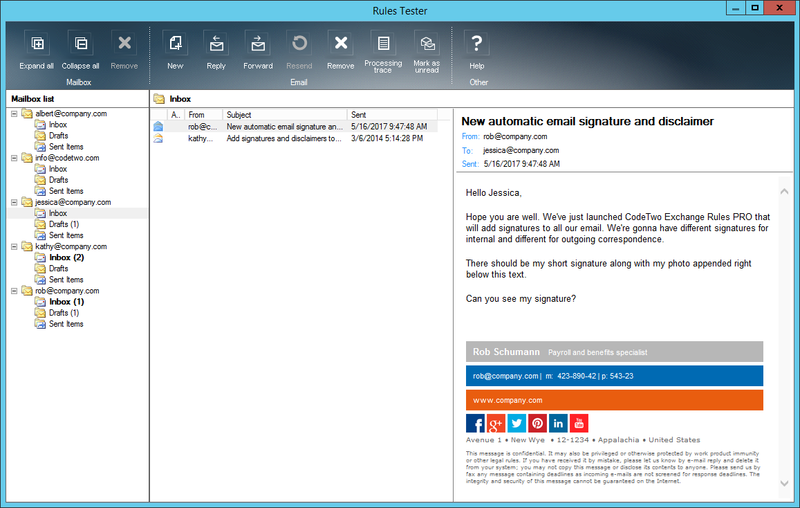 NOTE: If you are using a 3rd party tool like CodeTwo Exchange Rules or CodeTwo Exchange Rules Pro you can take advantage of the Rules Tester feature to test your email signature. To learn how to remotely connect to Office 365 using PowerShell, see this article. This script sends an email with the subject “Test of new company email signature” and body “Hello, Please check if your details are correct” from each user to themselves. This script sends an email with the subject “Test of new company email signature” and body “Some text” from each user to a single (your) mailbox. To limit the range of senders, use any of the Get-Mailbox cmdlet’s parameters. Having run this test, you can make any adjustments you feel are necessary and then enjoy your new email signature.